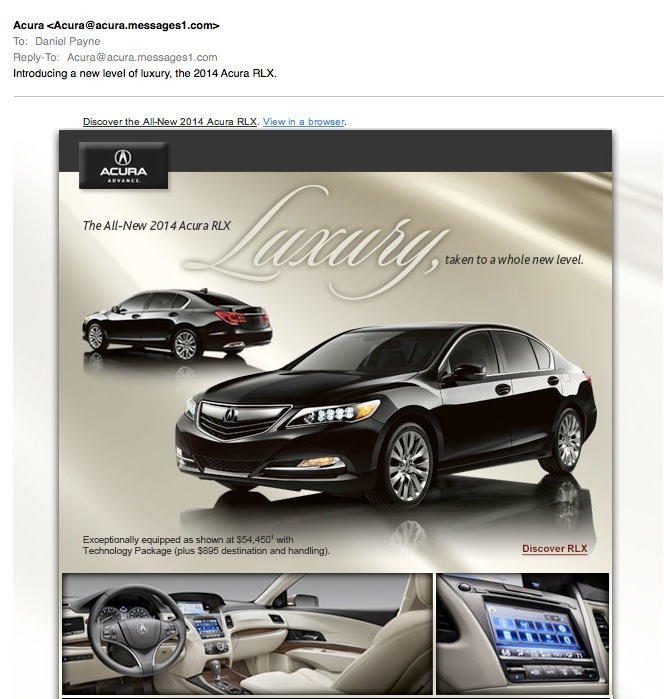 I’ve been a loyal Acura car owner for many years and some how I got added to their email list, but then decided that I no longer wanted to receive their emails. I then phoned Acura support at 800 382 2238 and asked to be removed from their email list. The Acura phone support asked for my phone number to find my account, but when I provided my phone number he couldn’t find the account. Next he asked for my Vehicle Identification Number which I was unwilling to give him. Finally he asked for my name and had me wait several minutes on hold. Eventually he asked me to forward my latest Acura email to a special address. All of this process was a big hassle and inconvenience to me, a somewhat less than happy Acura customer. I’m shocked that Acura has not mastered the art of email communications, and hope that in your business that you will comply with the CAN-SPAM act and make it easy for subscribers to quickly opt-out without placing them in a catch-22 situation where they cannot opt out themselves.